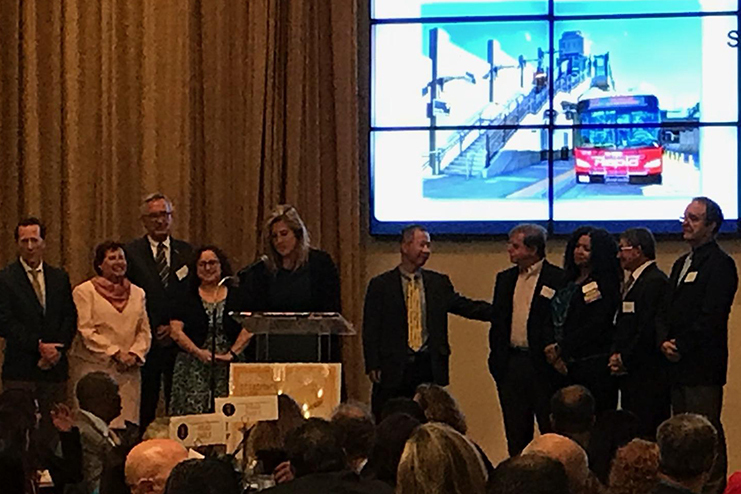 SR 15 Mid-City Centerline Rapid Transit Stations project was awarded the WTS San Diego Alternative Modes & Active Transportation Award on September 20, 2018. WTS San Diego is the leading organization for transportation professionals and students interested in transportation careers. The organization helps women find opportunity and recognition in the transportation industry. The SR 15 Mid-City Centerline project is San Diego’s first freeway-level transit stations project along SR 15 at El Cajon Blvd and University Ave. Three miles of new transit-only lanes were also constructed within the existing SR 15 median. It includes outdoor elevators at platform levels, and four unique pedestrian bridges and stairs and sound panels. The plazas include bicycle facilities, transit information kiosks, site furnishings, and public art. The project development team was highly collaborative from the early planning phases through to the completion of construction. This included women professionals in many of the phases of production. Teralta Park, the Centerline Stations, and the SR-15 Commuter Bikeway were designed in collaboration with Caltrans, City of San Diego, SANDAG, City Heights Community Development Corporation, and residents of Mid City. CH2M Hill (now known as Jacobs), IBI Group, and KTUA were the main consulting firms involved in the planning/design. The projects were constructed by Caltrans. They’re owned by Caltrans and the City of San Diego.